Get ready to say goodbye to winter and dive head-first into a visit to Shedd Aquarium this spring. Visit the brand new exhibit, Amphibians, this May and get to know 40 species of salamanders, frogs and rarely-seen caecilians. Shedd’s popular Stingray Touch exhibit will reopen after the long winter, offering a chance to interact with stingrays and touch their silky-smooth backs. Craving something really wild? Head over to Shedd’s Wild Reef exhibit or take a behind-the-scenes tour and let your mind drift to the Philippines. See if you can spot Shedd’s newest rescue dog, Kobe, going for a walk and working with his trainers. 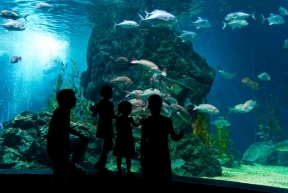 For more information, visit www.sheddaquarium.org.